AFC Rushden & Diamonds' first season at Step 3 hit new heights on Tuesday night. Andy Peaks’ team went into their re-arranged clash with Halesowen Town having claimed a point in a 1-1 draw at Lowestoft Town last weekend thanks to Ben Farrell’s last-gasp penalty. And they followed it up in perfect fashion with a 2-0 success at Halesowen Town, despite having Ben Diamond sent-off for two bookable offences in the second half. Diamonds were already in control by then thanks to Farrell’s deflected effort and a 10th of the campaign for all-time leading goalscorer Tom Lorraine. The win proved to be significant as it moved Diamonds up to a season-high position of third. Two more tricky tests on the road now await them over the next couple of weeks. They head to fifth-placed Leiston tomorrow (Saturday) and then travel to fourth-placed Alvechurch next weekend. 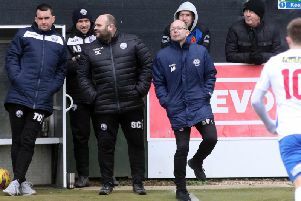 Two more good results would certainly confirm Diamonds as play-off contenders in the Evo-Stik League South Premier Division Central as the season approaches the halfway mark. But boss Peaks insists there is no pressure on his team going into two eye-catching fixtures. And he believes the win over Halesowen has given his players the licence to enjoy the big games. “It’s nice to look at the league table and see the club in that position,” the Diamonds manager said. “It might be a bit top heavy in our favour because of the games we have played but the fact we are where we are is just further confirmation of how far the club has come. “It’s a good league and we have played the majority of teams now and I think it’s fair to say there isn’t a lot to choose between most of the sides. “We are pleased with what we have done so far but we know we need to keep on picking up points. “For me, the next two games are nice ones to have. “We are up against teams who are probably expected to be around the top-five area and we have got enough points on the board to be able to go and enjoy it. “It’s a chance to go and test ourselves against two top teams without having the pressure of desperately needing the points. Diamonds will have at least one new face on show at the weekend after they confirmed the signing of winger Sam Johnson from Kempston Rovers. After starting his junior footballing career in East Anglia, Johnson has also spent time in the Netherlands and New Zealand as well as having two spells at Kempston, first joining then at the end of 2013.